Background and objectives Approximately one million Americans initiated chronic dialysis over the past decade; the first-year mortality rate reported by the U.S. Renal Data System was 19.6% in 2007. This estimate has historically excluded the first 90 days of chronic dialysis. Design, setting, participants, & measurements To characterize the mortality and hospitalization risks for patients starting chronic renal replacement therapy, we followed all patients initiating dialysis in 1733 facilities throughout the United States (n = 303,289). Mortality and hospitalizations within the first 90 days were compared with outcomes after this period, and the results were analyzed. Standard time-series analyses were used to depict the weekly risk estimates for each outcome. Results Between 1997 and 2009, >300,000 patients initiated chronic dialysis and were followed for >35 million dialysis treatments; the highest risk for morbidity and mortality occurred in the first 2 weeks of treatment. The initial 2-week risk of death for a typical dialysis patient was 2.72-fold higher, and the risk of hospitalization was 1.95-fold higher when compared to a patient who survived the first year of chronic dialysis (week 53 after initiation). Similarly, over the first 90 days, the risk of mortality and hospitalization remained elevated. Thereafter, between days 91 and 365, these risks decreased considerably by more than half. Surviving these first weeks of dialysis was most associated with the type of vascular access. Initiating dialysis with a fistula was associated with a decreased early death risk by 61%, whereas peritoneal dialysis decreased the risk by 87%. Conclusions The first 2 weeks of chronic dialysis are associated with heightened mortality and hospitalization risks, which remain elevated over the ensuing 90 days. In 2008, 112,476 Americans initiated chronic dialysis to survive the otherwise fatal complications of ESRD (1). The annual number of patients initiating dialysis has grown substantially over the past decade (2) and is expected to increase further, consequent to the shortage of donors for renal transplantation (3,4), lack of therapies to reverse the progression of renal failure, and the growing prevalence of diabetes and hypertension, the leading causes of progressive chronic kidney disease (2). Since 1973, Medicare has financed the cost of chronic dialysis for most Americans such that those who needed this life-saving intervention would receive it (5–7). Social security beneficiaries (generally those older than 65 years) who start dialysis qualify for Medicare immediately, whereas others become eligible only after their first 90 days of chronic renal replacement therapy (8). The U.S. Renal Data System (USRDS) has reported outcomes for dialysis-dependent Medicare patients since 1988; however, most of these analyses exclude the first 90-day period because approximately 60% of patients initiating dialysis are younger than 65 years and do not qualify for Medicare benefits within these first 90 days (9). Although mortality for American ESRD patients who survived the first year of dialysis has improved by approximately 10% over the past decade, improvements in mortality during the first year, even without including the initial 90 days, have been only minimal over the same time period (2,10). Many studies have investigated survival in dialysis patients, yet only a few have focused on survival in the early period after the initiation of chronic dialysis (11–14). Indeed, most clinical trials have included prevalent and not incident patients, and data collection in this initial 90-day period is limited (15–18). 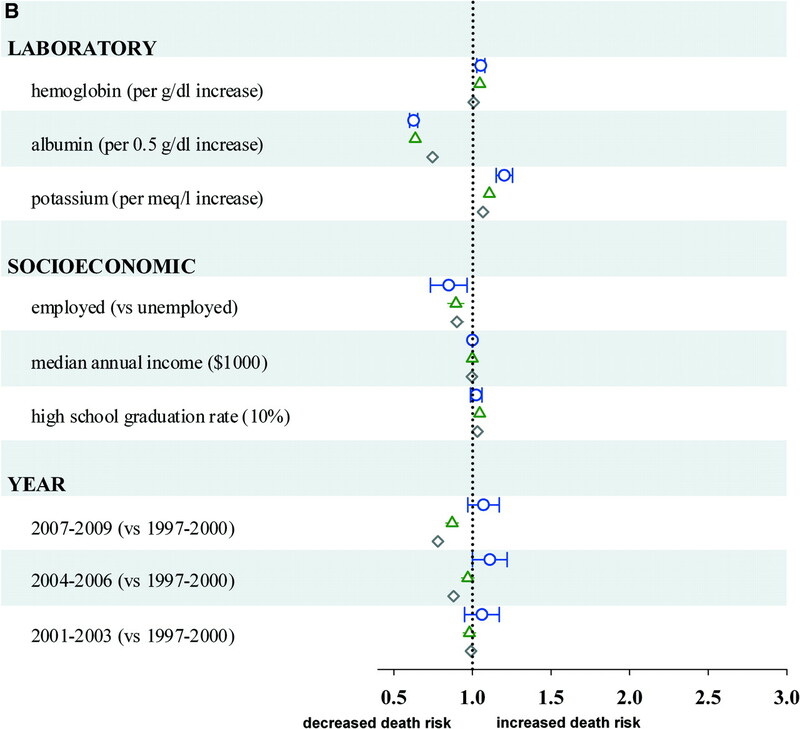 The few studies on early dialysis mortality have reported rates well above the national ESRD annual mortality rate of approximately 20% (12–14,19,20); however, the magnitude, progression, and risk factors associated with this early mortality remain unclear given marked differences in the reported death rate among these studies. Herein, we describe the characteristics, mortality, and hospitalization risks for a large cohort of patients starting chronic dialysis. A cohort-based examination of all patients who initiated chronic dialysis was conducted among facilities operated by Fresenius Medical Care North America (FMCNA), a large integrated provider of chronic renal replacement therapy. From January 1, 1997, to December 31, 2009, we identified all patients who initiated chronic dialysis and followed them for up to 1 year, during which time data collection occurred for specific demographic, risk factor, and outcome parameters. Patients from 48 states, the District of Columbia, and the Territory of Puerto Rico were included, and only incident hemodialysis patients dialyzed at home were excluded from the analysis (1% of subjects). Overall, the cohort comprised approximately 30% of all patients initiating dialysis over a 13-year period and is representative of the U.S. ESRD population at large (2). Data were prospectively collected from each patient through the FMCNA health information system, which monitors individualized dialytic sessions in all participating outpatient facilities. The system coordinates electronic patient registries, point-of-care medical charting, electronic order entry, billing, and clinical quality reporting. Facility and staff receive regular training on standardized data entry practices and quality monitoring policies. Registration and charting in the information system is a prerequisite before a patient can receive treatment at every patient encounter, which typically occurs three times per week in hemodialysis patients and once per month in peritoneal dialysis patients. Data transcripts are routinely reviewed and reconciled by a designated facility nurse after each treatment shift, before the data are aggregated into a central server for further facility-level quality monitoring and auditing. We queried the central data warehouse to identify all incident dialysis patients for the study with abstraction of relevant demographic, treatment, and clinical parameters. All patient identifiers were removed before the data were analyzed, according to procedures per FMCNA Office of Health Compliance policy. Socioeconomic data were derived from the U.S. Census-Block data (2000) linked by the patient's five-digit zipcode of residence (21). Individual cases of death and hospitalization were monitored in the study cohort and were reported as the primary outcome of the study. Death records were maintained in the information system to comply with federal regulations (42, U.S.C 426; 20 CFR 405, section 2133). Accurate hospitalization data were also maintained, so that only outpatient administered dialysis treatments were billable and all patients missing from treatment were accounted for. During the 1-year follow-up period, we used time-series analyses to graphically describe the relative mortality and hospitalization trend on a weekly basis, where the referent category for all analyses was patients who were alive on week 53 (1 year after dialysis initiation). Baseline patient characteristics (demographics, race, comorbidity, and history of previous inpatient dialysis) were enumerated on initial admission to the dialysis unit, mostly from hospital discharge summaries. Subsequently, clinical parameters were charted at the dialysis chair with each patient encounter. For example, blood pressure and weight measurements were recorded in 99.4% of administered treatments. Vascular access documentation was verified and updated with each patient encounter to include anatomical location, delivered blood flow rate, and access type (arteriovenous fistula or graft, venous catheter, or peritoneal access). Comorbid conditions were stratified by organ system as cardiac, diabetic, coronary artery, peripheral artery, central nervous system, hematologic, pulmonary, liver, neoplastic, psychiatric, gastrointestinal, or musculoskeletal disease. Comorbidity scores were assigned as the number of diseased organ systems for each patient. Laboratory values were processed under a single, accredited central laboratory (Spectra Laboratory, Rockleigh, NJ). Poisson regression was used to calculate the unadjusted relative risk (RR) of death and hospitalization over the first consecutive 52 weeks of dialysis when compared with 1-year survivors. Death and hospitalization outcomes were reported as RR and displayed graphically by each week over the first year of dialysis. Risk factors were tabulated in the full population and then by patients who died, according to the time period of death during the first year. We sought to describe the population of patients starting dialysis in the United States with further comparison among patients who died at different time intervals in the first 365 days of chronic renal replacement therapy. Risk factor analysis was conducted by the simultaneous inclusion of baseline demographic, vascular access, comorbidity, patient, hemodynamic, laboratory, and socioeconomic characteristics into Poisson models and the effect estimates reported in forest plot format (RR with 95% confidence intervals [CIs]). No parameters were removed from the final model, and a two-sided P-value <0.05 was considered to indicate statistical significance. Concurrently, 12 stratum-specific time-series curves for mortality were also produced by individual risk factor. Each figure was generated by partitioning the cohort by risk factor strata (by tertiles among continuous variables), followed by the graphical representation of longitudinal mortality over 52 consecutive weeks. Data analyses were executed using SAS version 9.1 (Cary, NC). During a 13-year period, 303,289 patients initiated chronic renal replacement therapy within an integrated network of more than 1500 outpatient dialysis facilities. 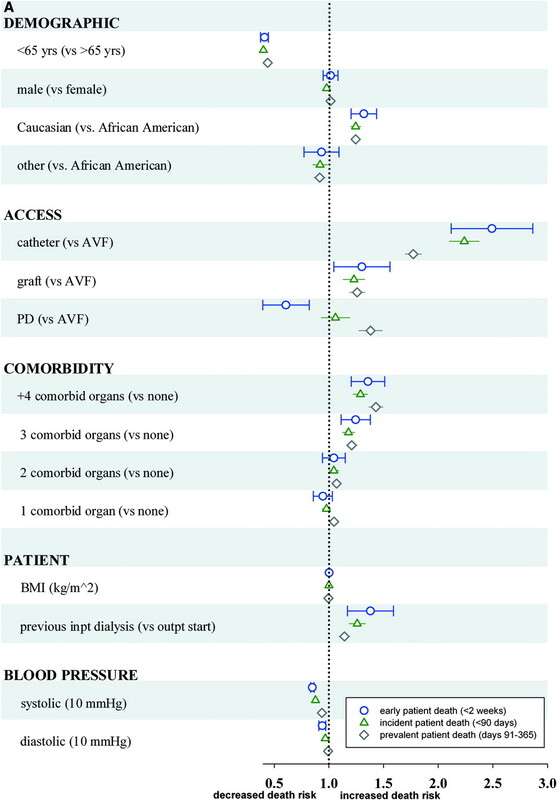 Patients initiating chronic dialysis were typically older (46% were ≥65 years old) and African American (29% of patients), when compared with the U.S. population at large (Table 1) (21). Seventy percent of patients started dialysis with a catheter vascular access, and most had several comorbidities and evidence of malnutrition (i.e., low serum albumin). Most patients were not in the labor force at the time of dialysis initiation and less than half had completed high school. We followed these patients over 35 million dialysis treatments for death and hospital visits. During the first year of chronic dialysis, patient mortality (Figure 1A) and hospitalization (Figure 1B) were considerably higher immediately after the initiation of dialysis and highest during the first 2 weeks. Nine percent of first-year deaths occurred in the first 2 weeks of chronic dialysis, whereas 44% of first year deaths occurred in the initial 90 days. (A) Among patients starting chronic dialysis (n = 303,289), the relative risk of death at each 1-week interval was compared with a reference group of patients who survived the first year of dialysis. The period of highest death risk occurred in the second week (relative risk [RR] = 2.86; 95% confidence interval [CI] 2.63 to 3.12; referenced to patients who survived the first year of dialysis). Patients were followed over 35,067,157 dialysis treatments for mortality outcomes. (B) Among patients starting chronic dialysis (n = 303,289), the RR of hospitalization at each 1-week interval was compared with a reference group of patients who survived the first year of dialysis. The period of highest hospitalization risk occurred in the first week (RR = 1.98; 95% CI 1.92 to 2.03; referenced to patients who survived the first year of dialysis). Patients were followed over 35,067,157 dialysis treatments for hospitalization outcomes. Within the first 2 weeks of treatment, a patient experienced a 2.72-fold higher (95% CI 2.50 to 2.94) likelihood of death and a 1.95-fold higher (95% CI 1.92 to 2.01) likelihood of hospitalization when compared with a patient who survived the first year of dialysis. These risks were also apparent throughout the first 90 days of dialysis, yet decreased substantially thereafter. The first 90-day (including the first 2 weeks) RR of death was 2.16 (95% CI 1.99 to 2.31), which decreased to 1.16 (95% CI 1.07 to 1.26) on days 91 to 365. Similarly, the first 90-day relative risk of hospitalization was 1.51 (95% CI 1.47 to 1.55), which decreased to 1.10 (95% CI 1.07 to 1.13) on days 91 to 365. Hospital stays were longer with the average length of stay higher by 0.7 days in the first 14 days (P < 0.001) and 0.3 days in the first 90-day period (P < 0.001), relative to patients after 1 year of dialysis. We uncovered several factors that associate with prolonged dialysis survival. For example, a patient who survived the first 2 weeks of treatment was more likely to dialyze with an arteriovenous fistula and have a higher albumin level (Table 1). Subsequent multivariate risk factor analyses were performed (Figures 2 and 3). Surviving the first weeks of dialysis was most associated with starting hemodialysis with an arteriovenous fistula (RR = 0.39; 95% CI 0.33 to 0.46; referent to catheter) or with an albumin ≥4.0 g/dl (RR = 0.47; 95% CI 0.42 to 0.55; referent to albumin <4.0 g/dl). Conversely, catheters were associated with the highest 2-week death risk (RR = 2.49; 95% CI 2.12 to 2.93; referent the fistula). Peritoneal dialysis patients experienced an initially low mortality risk (RR = 0.61; 95% CI 0.39 to 0.93; referent to AVF) that increased to 1.38 (95% CI 1.27 to 1.50) on days 91 to 365. Adjusted relative risk of early, incident, and prevalent death by risk factor. PD, peritoneal dialysis; AVF, arteriovenous fistula; inpt, inpatient; outpt, outpatient. (A) Stratum-specific time-series curves for death by potentially treatable factors (modifiable). (B) Stratum-specific time-series curves for death by patient factors (fixed). PD, peritoneal dialysis. Over the 13-year study period, 90-day incident ESRD death rates decreased by 13% (P < 0.0001) and 1-year death rates decreased by 22% since 1997. In contrast, the mortality rate in the first 14 days did not significantly change from 1997 to 2009 (Figure 2). We followed more than 300,000 incident American ESRD patients receiving more than 35 million chronic dialysis treatments during their first year of renal replacement therapy. We found a more than twofold increase in the risk for death and hospitalization in the first 90 days of dialytic therapy, where the most substantial risk occurred in the first 2 weeks. Overall, these first weeks of chronic renal replacement therapy warrant increased attention, because dialysis patients appear most vulnerable during this time period. Disease registries have significantly contributed to understanding the natural history, prevalence, and determinants of medical disease (22). In the dialysis population, the USRDS (2), for example, follows Medicare patients on chronic renal replacement therapy and provides the nephrology community with a series of vital statistics that describe the state of the ESRD population as a whole; however, most USRDS analyses exclude the first 90 days when registration and Medicare data collection does not occur in the full U.S. dialysis population (2). For example, patients younger than 65 and not medically disabled must wait at least 90 days after their first ESRD service date before they become Medicare eligible. The few studies of incident dialysis patients in these initial 90 days have reported variable early mortality rates between 24 and 50 deaths per 100 patient-years (12–14,19,20,23). Such inconsistencies between studies may occur because incident patients may be unintentionally censored prematurely from disease registries, which may obscure important outcomes that occur in the first 3 months of dialysis. For example, The Centers for Medicare & Medicaid Services, the USRDS, and renal research communities rely on the ESRD Medical Evidence Form (2728) to identify new chronic dialysis patients. This form can be submitted by the provider up to 45 days from ESRD initiation (24). Indeed, many incident dialysis patients may die within these 45 days before the Medical Evidence Form can be even completed. In this study, we overcame such limitations in patient registration and premature censorship through integrated clinical and billing information systems that mandated charting with each treatment session in all facilities of a large dialysis provider. Consequently, we were able to identify all 303,289 patients initiating chronic renal replacement therapy and followed these patients through every single treatment (three times per week on average). 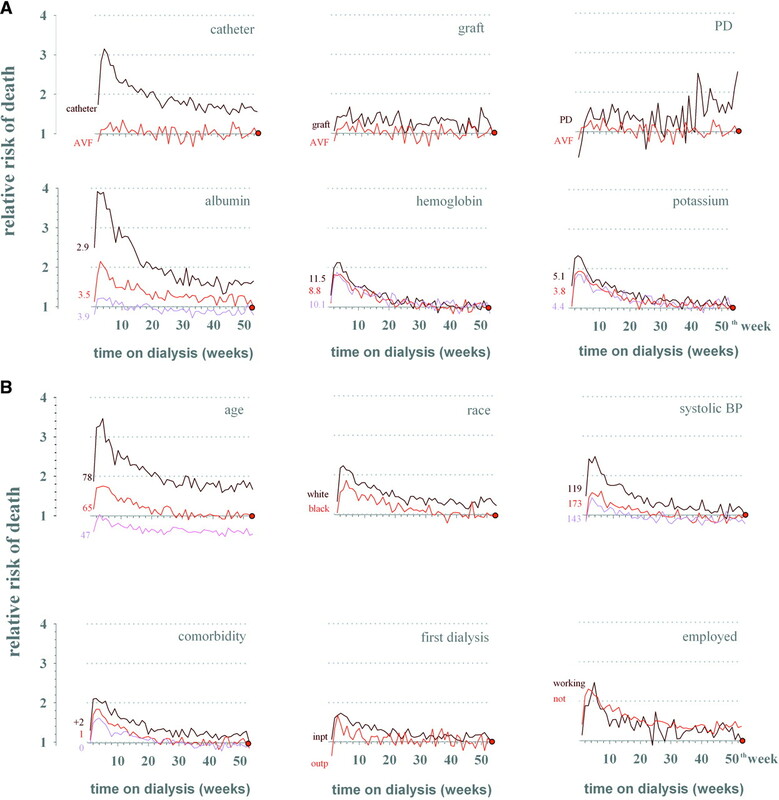 We were able to partition and analyze our data by each week, to uncover large variations in death and hospitalization risks during the first year, where the highest risks occurred in the first 14 days of dialysis. These high risks for death became attenuated by the 90th day of dialysis. For example, the weekly risk for death peaked on the second week and then decreased by more than 50% once a patient reached their 90th day on dialysis. In contrast, a previous study on a subset of Medicare patients reported that the largest mortality occurred later, in the second month of treatment (25). Another study reported only a 26% increased risk of death in the first 120 days when compared with the period after those 120 days (14). Again, such discrepancies between these studies and our study may be partially explained by the delayed identification and recruitment of study subjects (survivorship bias), which has been avoided in this study. We also conducted risk factor analyses that revealed which patients were prone to early death. In the initial 14 days, those with a catheter vascular access (versus fistula), a preventable risk factor, demonstrated a twofold mortality increase, even after accounting for common comorbidities and other potential confounders linked to mortality. In contrast, a patient with an arteriovenous fistula or on peritoneal dialysis had improved early (14 and 90 days) dialysis survival. Despite these high morbidity and mortality risks in the first few weeks of dialysis, we observed reductions in 90- and 365-day mortality from 1997 to 2009, which may be attributed to improvements in process-related measures of quality and better disease management (10,13,26–28). Similarly, increasing pre-ESRD programs (29,30) that provide education, emotional support, improved nutrition, and reduce catheters in patients before they start dialysis have the most potential to improve 2-week mortality rates going forward. Our study cohort was representative of the U.S. dialysis population and spanned a considerable spectrum of socioeconomic, practice patterns, and patient characteristics. When compared with U.S. Census statistics, we found distinct differences between the typical patient starting dialysis and the American population at large (21). A new chronic renal replacement therapy patient was approximately four times more likely to be ≥65 years old, twice as likely to be African American, and three times more likely to be unemployed. The patients lived in communities where only half of residents were high school graduates and the annual household income was lower than the national average. Only 14% of patients started dialysis with an arteriovenous fistula, which is the recommended form of access by the National Kidney Foundation's Kidney Disease Outcomes Quality Initiative (31). Despite these disparities, we found that such socioeconomic factors were only minimally associated with patient mortality, whereas modifiable factors such as vascular access were more strongly associated with good outcomes. Our study has limitations. We captured and followed all patients from the first day of outpatient dialysis, but did not have records of antecedent hospital and clinic encounters during chronic kidney disease. The risk of early death may be higher if the study entry point was redefined from the point of first ever dialysis or by GFR. Such a definition would include subjects with very high mortality such as acute renal failure patients who initiate dialysis in a hospital and ESRD patients who refuse dialysis. Indeed, residual confounding may explain the statistically significant relationship between risk factor and mortality. Finally, it is possible that the high incident mortality may reflect palliative patients who do not tolerate the rigors of dialysis and choose to withdraw from renal replacement therapy; however, we did not have the means to identify such patients in the dataset. In conclusion, mortality in the initial 90 days of chronic dialysis is high, yet it is declining in the setting of continuous process improvements and medical risk factor management (10,13,26–28). Nevertheless, additional efforts are needed for this critical period, particularly in the first 2 weeks, for further gains in incident patient outcomes. Such efforts may include more emphasis on medically preparing CKD patients for impending dialysis. Drs. Chan, Hakim, and Maddux are employees of Fresenius Medial Care North America. Dr. Thadhani has received grants from Abbott Labs and is a consultant to Shire Biopharmaceuticals and Fresenius Medial Care North America. See related editorial, “A Preponderance of Evidence Is Sufficient,” on pages 2561–2563. United States Census Bureau: 2000 Census summary files. Washington, D.C.: Department of Commerce.